Gentle Monster styled as GENTLE MONSTER (Hangeul: 젠틀몬스터) is a Korean sunglasses and optical glasses brand founded by Hankook Kim in Seoul, South Korea in 2011. As of April 2018, the company has 41 directly operated stores worldwide, including in Korea, the United States, Singapore, and China. 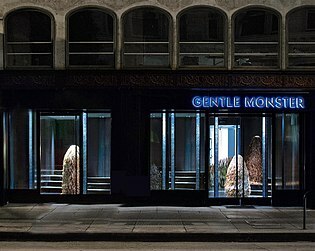 Gentle Monster employs 6 people to design its eyewear products and 60 people to design the store visuals. Its products are exhibited like museum pieces in "an immersive and experiential offline shopping experience." For example, in May through August 2016 its New York City flagship store was turned into an underwater experience creates with aquarium designer Justin Muir and glass sculptor Ivan Lee Mora, influenced by the French film Le Grand Bleu. Serial entrepreneur Jae W Oh invested about $100,000 in 2012 and Gentle Monster began producing frames in Daegu, which had been a manufacturing hub for Luxottica, and China, since acetate frames are illegal to produce in South Korea. The brand's designs favor oversize frames much larger than Western brands' because its Asian clientele prefer to have frames that create an image of a smaller face. In 2013 and 2014, Korean actress Jun Ji-hyun wore Gentle Monster lenses on My Love From the Star, and this greatly broadened the brand's exposure to a mainstream audience. In February 2016, the company's first US store opened on Grand Street in SoHo, New York City. Its second US store opened in downtown Los Angeles in October 2017. French luxury goods conglomerate LVMH invested $60 million for a 7% stake in the company in September 2017. In 2018 the brand did a collaboration with Alexander Wang and 10 corso como Seoul. In 2017 the brand did a collaboration with Dutch furniture company Moooi. In 2016 the brand collaborated with Henrik Vibskov, Hood By Air, and Opening Ceremony. Tilda Swinton collaborated with Gentle Monster in February 2017 in designing three sunglasses and appeared in an ad campaign video. The brand shows at New York Fashion Week. In 2016 the brand collaborated with Danish designer Henrik Vibskov, Hood by Air, and Opening Ceremony. In 2017 the brand collaborated with Dutch furniture designer Marcel Wanders, the founder of Moooi. In 2018 the brand collaborated on an exhibition called Burning Planet with South Korean rapper, Song Mino of Winner. Miranda Kerr, Jessica Alba, Beyonce, Gigi Hadid, Susan Sarandon, Kendall Jenner, Bella Hadid, Lupita Nyong'o, Brie Larson, Elle Fanning, Zoe Kravitz, Chloe Sevigny, and Tilda Swinton are fans of the brand. ^ "젠틀몬스터, 송민호와 아트 콜라보레이션 '버닝플래닛' 오픈". MBN. October 4, 2018. This page was last edited on 5 November 2018, at 10:53 (UTC).